Before performing an x-ray examination of the ankle technologist must evaluate the ankle condition to avoid additional injuries. Forcing the foot to dorsiflex can be painful and may cause additional injuries. A true AP projection of the ankle is the malleoli is not the same distance from the image receptor in the anatomic position. The lateral malleolus should be about 15° more posterior. Therefore, the lateral portion of the mortise joint should appear open, if this portion of the ankle joint did not appear open on a true AP, it may suggest a spread of the ankle mortise from the ruptured ligaments. 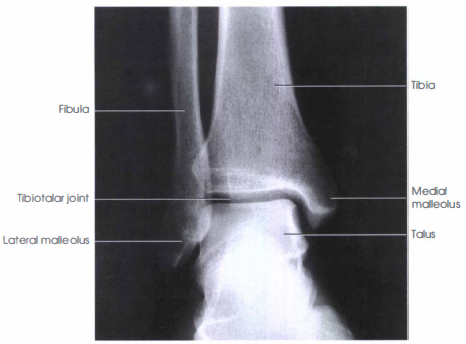 Any bony lesions or diseases involving the ankle joint, distal tibia and fibula, proximal talus, and proximal fifth matatasal are shown. (The lateral portion of the ankle joint space should not appear open on this projection). 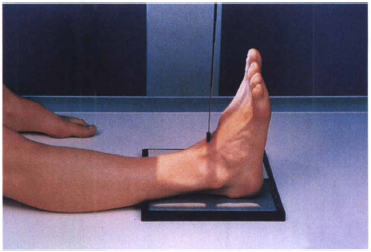 Do not force dorsiflexion of the foot but allow it to remain in its natural position. Adjust the foot and ankle for a true AP projection. Ensure that the entire lower leg is not rotated. The intermalleolar line will not be parallel to IR. Take radiograph with patient in the supine position; place pillow under head; patient's leg should be fully extended. Collimate to lateral skin margins; include proximal one-half of matatarsals and distal tibia-fibula. 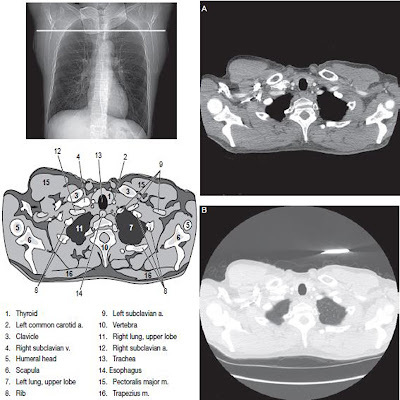 Close collimation and lead masking are important over unused portions of image plate to prevent fogging from scatter radiation to the hypersensitive image plate or receptor. The distal one-third of the tibia-fibula, the lateral and medial malleoli, and the talus and proximal half of the metatarsals should be demonstrated. The long axis of the leg should be aligned to collimation field and to IR. No rotation if the medial mortise joint is open and the lateral mortise closed. some superimposition of the distal tibia and talus will exist. CR and the center of the collimation field should be to the tibiotala joint midway between the medial and lateral melleolus. The four-sided collimation should include the distal one-third of the lower leg to the proximal half of the matatarsals. All surrounding soft tissue also should be included. Optimal exposure with no motion will demonstrate clear bony margins and trabecular markings. Talus must be penetrated enough to demonstrate the cortical margins and trabeculae of the bone. Soft tissue structures also must be visible.